Sarova Shaba Game Lodge is located in a natural oasis in the heart of the Shaba Game Reserve just east of Samburu‚ or one can say‚ in the "Born Free Country" that Joy and George Adamson called home for many years. 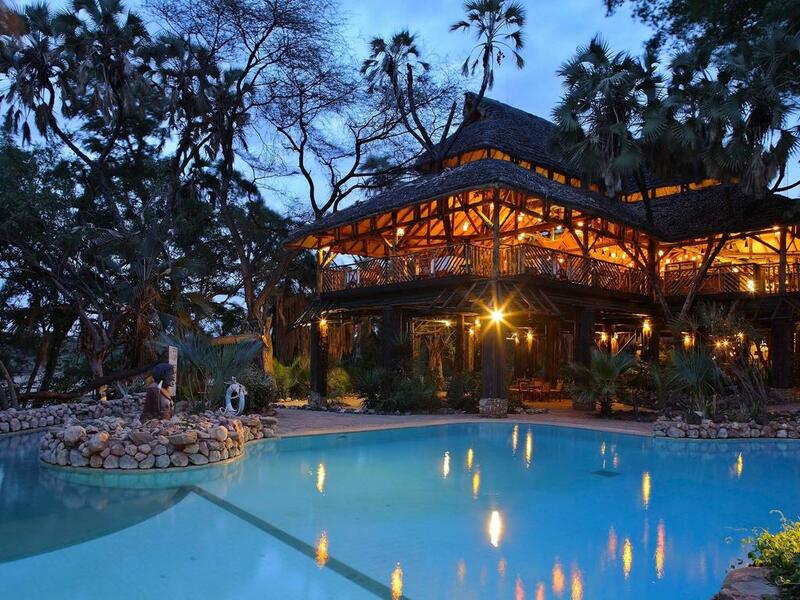 The lodge is 314 km from Nairobi‚ a 45 minute flight from Nairobi to Shaba or Kalama Samburu airstrip. It is set along the bank of the Ewaso Nyiro River laid out around the natural springs that flow into the river. The Lodge has a virtual mini forest of indigenous trees‚ a fish pond and a large free form swimming pool. Upon arrival at the airstrip‚ you will be met by a driver/ guide who will transfer you to the lodge to check in‚ from the airstrip you will enjoy a short game drive viewing. After lunch you will depart for a late afternoon game drive or enjoy other activities offered at the Lodge. The Shaba Game Reserve is home for the Grevy Zebra‚ Reticulated Giraffe and Gerenuk which are only found in this part of Kenya‚ herds of Elephants‚ Lions‚ Crocodiles‚ Cheetah‚ and different species of birds. An early morning game drive followed by bush breakfast and/or bush lunch served on the banks of the Ewaso Nyiro River. Other activities are available like camel Safaris‚ traditional Samburu village visit‚ nature walks‚ bird watching‚ indoor games‚ and spa.